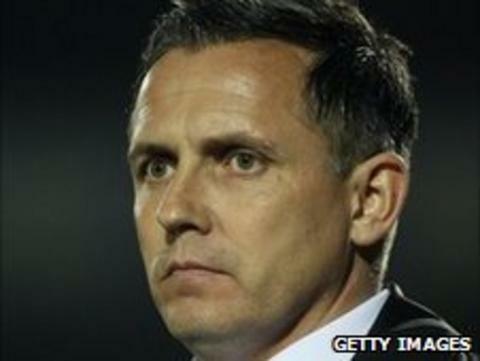 Paul Buckle has left Torquay United to become the new Bristol Rovers manager. The 40-year-old's exit from Plainmoor comes two days after the Gulls lost 1-0 to Stevenage in the League Two play-off final at Old Trafford. Rovers, who were relegated from League One this season, have been without a permanent manager since the sacking of Dave Penney in March. "Obviously I leave Torquay with a heavy heart but it's right to go now," Buckle told BBC Radio Bristol. "It's a massive club and it's a big step-up for me there's no doubt about that. "It's my second job, I've had a lot of success at Torquay and I plan on coming to Rovers and doing the same. "I'm someone who's ambitious and I'll try to bring a winning mentality to the club. "There's an awful amount of work to do, there's lots of players to sign. "I've got to come in and see the staff and players that are already here. Once I've had a few days off I'll be ready to hit it head on." The former midfielder became Torquay manager in 2007 following the club's relegation to the Conference and guided them back to the Football League in 2008/09. After a 17th-place finish in their first season back in League Two, the Gulls finished seventh this term and secured a place in the play-offs on goal difference. Now I'm moving on to pastures new and I can't wait to get started. "It's been an incredible journey," said Buckle. "I could never have dreamt it could have gone that well, so credit to everyone at the club and I've left it in good hands. "Now I'm moving on to pastures new and I can't wait to get started." Rovers started this season with Paul Trollope in charge but he was sacked in December after a poor run of results and Penney was appointed in January. However, the Yorkshireman lasted only two months in the job after failing to turn their form around. Pirates captain Stuart Campbell was put in caretaker charge until the end of the season but was unable to save his side from relegation.